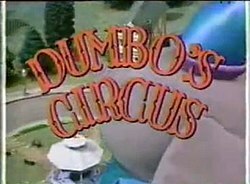 Dumbo's Circus is a live action/puppet television series that aired on The Disney Channel beginning on May 6, 1985, and featured the character of Dumbo from the original film. The series was in production for three and a half seasons, and reruns continued to air until February 28, 1997. The cast members are human-sized anthropomorphic animals played by people in puppet suits using technology developed by Ken Forsse, the creator of Teddy Ruxpin. The same production technique was used for Welcome to Pooh Corner. Unlike Welcome to Pooh Corner, the program has had no VHS, DVD or Blu-ray releases as of 2017[update]. Many of the show's cast went on to star in the Christian radio series, Adventures in Odyssey. The costumes and the wagon used in the show were both on display in the walk-in prop warehouse of the Studio Backlot Tour at Disney's Hollywood Studios in Lake Buena Vista, Florida. When the series first started, Sebastian is seen wearing only his hat, vest and short pants. After a few episodes, he is given a white T-shirt to go with it. Some of the puppets that were used for audience members in the circus were used for Mother Goose's Treasury. Dumbo (voiced by Katie Leigh) - Also known as the "World's Only Flying Elephant". Star of the circus, Dumbo still relies on his magic feather to help him fly. He can usually be seen pulling the Circus wagon from place to place up in the sky. Often breaks the fourth wall towards the boys and girls watching the show, telling them when it's time for a song or for the sideshow. Being an elephant, Dumbo's memory is usually very good (based on the expression "An elephant never forgets"), his hearing is very sharp and sometimes his sneezes are often strong - strong enough to cause some wind. Lionel (performed by Sharon Baird, voiced by Jim Cummings) - A Brooklyn accented lion who serves as Dumbo's right-hand partner, popcorn vendor, ticket taker. and sideshow barker. Has a knot in his tail. Lionel was inspired by the character of Timothy Q. Mouse from the 1941 film and says goodbye to the viewers at the end of several episodes. Lionel's voice is almost similar to Timothy Q. Mouse as well. Fair Dinkum (performed by Patty Maloney, voiced by Hal Smith) - Also known as "Dink" for short, he is a koala who serves as ringmaster of the circus. As he is from Australia, he has the accent they have as well. There are a few things that Dink is afraid of - heights (so he's scared of flying) and drowning in the water being a few of them. His name comes from the Australian phrase, "fair dinkum". Barnaby Bowser (voiced by Will Ryan) - A goofy dog who is the circus clown and magician as "Barnaby the Great". Known for saying "Ah-hee-ee-ee-ee-ee" whenever he laughs, and sounds like he's from the south. His magic tricks don't always work out the way he wants them to. Good friends with Lionel and Q.T. He also gets scared easily. Often hums his signature song "I'm Just a Lucky Dog". Comes from a big family - Edison Bowser (who invented flea powder), Isadoga Bowser (a famous dancer who perfected the "Dog trot"), Julia Bowser (Barnaby's favorite as she invented the hot dog) and his famous Uncle Lattimer Bowser, III. Barnaby shares a trait with Rabbit from Welcome to Pooh Corner (also voiced by Will Ryan) - both are gifted magicians. The only difference being that Rabbit's tricks usually work well, whereas Barnaby's doesn't always work the way he wants them to. Lilli (voiced by Patricia Parris) - The only female character before Matilda appeared, Lilli is a beautiful cat who serves as a tightrope walker in the circus. Sometimes wears glasses because of her bad eyesight - mostly to see things that are very close like books, signs and to play checkers. Likes pretty things. Q.T. (performed by Caleb Chung, voiced by Ron Gans) - A slow-witted, but good-natured orangutan who is the resident strongman and calliope player. In earlier episodes, he was accompanied by a small pink creature while playing the calliope. He makes friends easily, and has other talents, like kite making. Sometimes doesn't know his own strength. Sebastian (voiced by Walker Edmiston) - A purple alley cat who is usually reduced to janitorial duties and likes to nap any chance he gets. Sometimes tricks others (usually Q.T.) to do his own work, but sometimes his tricks backfire on him. In the side show, Sebastian has a ventriloquism dummy with him called Sly. Flip & Flap - A duo who are usually seen during the side show, telling each other jokes. They are identifiable by their appearances - Flip has long rabbit ears, and Flap has a red afro and a pig-like nose & cat-like ears, resembling a vampire bat. Rinkum Dinkum (voiced by Hal Smith) - A later addition to the series, Rinkum is Fair Dinkum's older twin brother. In contrast to Fair Dinkum, Rinkum is much more brave and doesn't scare easily. Like his brother, Rinkum speaks in an Australian accent. He joins the circus as the resident stunt performer. During the Side Show, Rinkum puts on a show in which the audience has to guess what country he once visited and is pretending to be from. Matilda Dinkum (voiced by Mona Marshall) - Another later addition to the series, Matilda is Rinkum and Fair Dinkum's younger sister and loves to dance. Also known as "Matty". Like her brothers, she speaks with an Australian accent. Her name comes from the famous Australian song "Waltzing Matilda". Lattimer Bowser, III (voiced by Laurie Main) - Barnaby's uncle who is a famous explorer. He looks like Barnaby, but is much older, with a moustache (which he occasionally brushes with his hands), and wears a monocle and a pith helmet. Speaks with an English accent. Fira (voiced by Jim Cummings) - Lilli's aunt, who speaks with an upper class accent. Looks like Lilli, but whereas Lilli only wears glasses for reading, she wears glasses all the time. Finds Sebastian to be sneaky, even if he is a cat. Mrs. Jumbo - Dumbo's mother, whom he sometimes talk about. "When the Circus Comes to Town"
"Boom, Boom, Ain't It Great to Be Crazy?" "The Squirrel on the Flying Trapeze"
"All In a Day's Play"
"Everyone Should Have a Song"
"The Nine Lucks of Sebastian"
"Think of All the Times"
"Teaching a Bird to Fly"
"A Lion Needs a Mane"
^ The Disney Channel Magazine, May 1985: pp. 13, 17. ^ "Biography". Jagcoproductions.com. Retrieved January 17, 2014. This page was last edited on 7 April 2019, at 13:01 (UTC).